The Forces of Nature are in the ascendency. Following the defeat of the denizens of the Abyss, the Green Lady’s power has spread throughout the land. The ancient powers of the Druids are more potent than ever and fierce Elementals flock to their command. Centaurs gallop through the forests, felling any foes that dare to enter their territory, while Naiads and Salamanders launch vicious attacks against those that threaten the will of the Green Lady. If you do not follow the way of Nature, it has never been more dangerous to roam the wilds of Mantica. A new power has entered the fray in Vanguard! 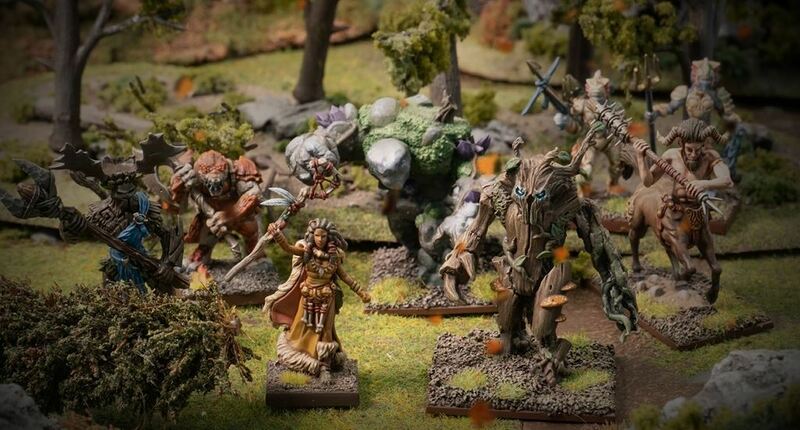 The Forces of Nature are the latest warband to get a Vanguard release. Choose from powerful Elementals, magical druids and vicious Salamanders to create a warband that excels in surprise attacks and ancient magic. Over the course of this week, we’ll be delving into the Forces of Nature warband by looking at their overall abilities and picking out key units. In today’s blog, we’ll look at their warband ability and unique spells. As you might expect, the Forces of Nature excel at moving through terrain. They have the Special Ability Forest Dwellers, which gives all models in the warband the Pathfinder rule and costs just 1 Power. This is particularly useful for getting to enemies that have hidden inside woods, as you’ll be able to move through the difficult terrain as though it was flat ground. As a result, you can easily get to enemies on the other side of terrain that would otherwise be unreachable. Alongside this you’ve got two more abilities: Lurker and Ambush. These two work together so you can launch surprise attacks against enemies. During Deployment you can choose one of your Support models and hide them in a piece of terrain – just make a note of the terrain piece and place your model to one side. During the game, you can then use the Ambush ability to spring a surprise attack against an enemy. When an enemy model ends its movement/action with 6” of the nominated terrain, the Lurker is revealed and placed in base to base contact with the foe. Once placed it can make a free Melee attack. This is particularly useful when combined with the Naiad Ensnarer. Although the Ensnarer doesn’t hit particularly hard, it can Fatigue enemies with its Trident. This is great for disrupting the plans of your opponent. For example, if the enemy is walking before preparing to Shoot, you can leap out, hit them with the Trident and then they won’t be able to complete the rest of their activation. Likewise you could also stop them capturing an objective by engaging them once they’ve finished moving. It’s important to note, that the Ambush ability will be updated on the warband cards, compared to the version that appears in the rulebook. We’ll also make sure this ability update is added to the FAQ and free downloadable rules. Barrier of Vines (long) – you can use one of your Spellcasters to create a 1” x 6” barrier that becomes height 10 impassable terrain and blocks line of sight. Although you can only have one Barrier of Vines per Spellcaster, this does mean you can block off charge lanes or protect units that have captured an objective. You can really cause havoc if you’ve got a pair of Spellcasters. With the right positioning, you can block off a large portion of the battlefield for your opponent because both Spellcasters can create a Barrier of Vines. You could even pin non-Flying units in place with some clever shennagians. Vengeful Flock (long) – this is a great spell for not only attacking an enemy, but also potentially moving them away from objectives or into a clear space ready to be charged/shot. The Vengeful Flock spell sends angry birds (not those ones) after their target and potentially all models within 2” suffer an attack too. Before the spell hits, the player rolls a D8 to check the effect of the spell. 7-8: the target suffers a 3D8 3+ Melee attack, can be moved 6” in a direction of the casting player’s choice, and is placed Knocked-down and Fatigued. If you get lucky, the Vengeful Flock spell is perfect for shifting enemies out of the way. 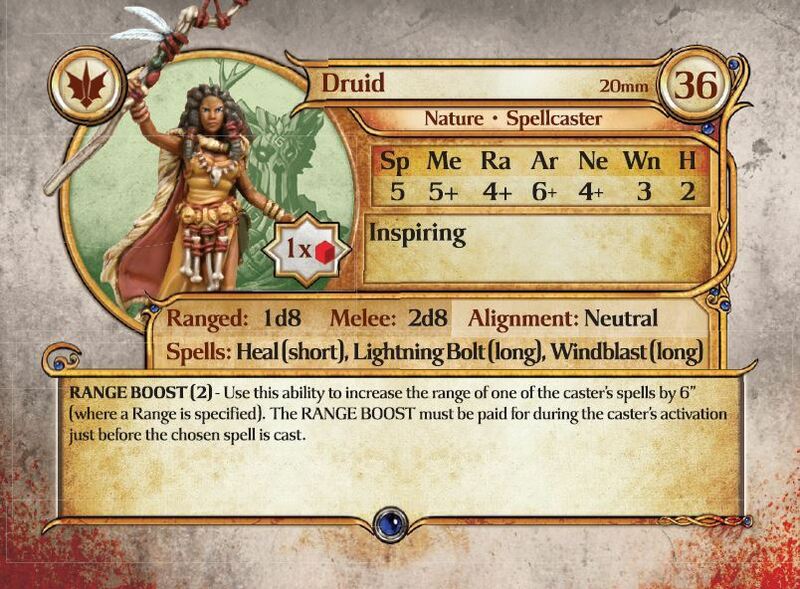 What’s more, as you can see from the Druid’s warband card, you’ve also got the opportunity to boost the range of your spells too. This means the Vengeful Flock can target an enemy up to 9” away, while the Barrier of Vines has a potential range of 15” – this is perfect for disrupting the enemy’s advance early in the game. Anyway, hope today’s short look at the Forces of Nature has got your imagination firing about what sort of warband you want to create. 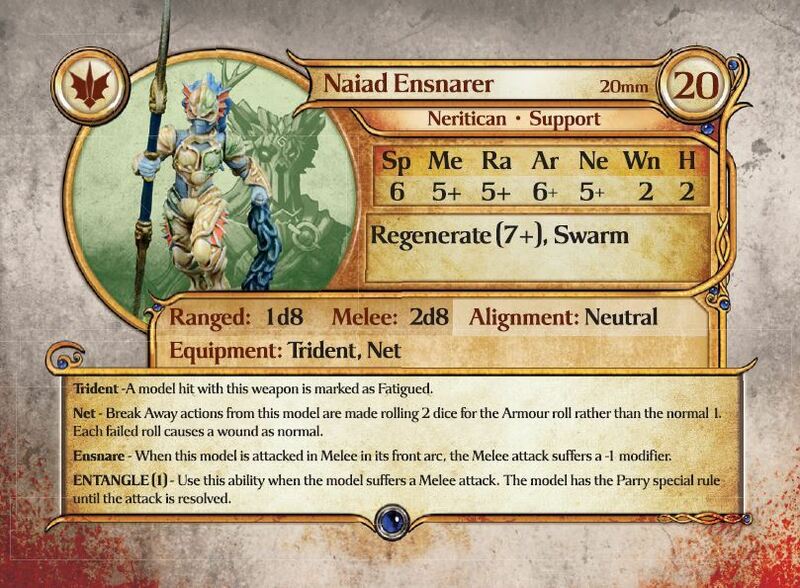 Next time we’ll be looking in more detail at some of the key units in the Forces of Nature warband. THE FORCES OF NATURE ARE NOW AVAILABLE TO ORDER FROM THE MANTIC WEBSITE. FOR A LIMITED TIME ONLY, ALL FORCES OF NATURE WARBAND SETS COME WITH A FREE SALAMANDER VETERAN. CHECK THE WEBSITE HERE. The post Forces of Nature: Spells & Abilities appeared first on Mantic Blog.